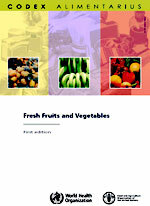 Codex standards for fresh fruits and vegetables and related texts such as the Code of Hygienic Practice for Fresh Fruits and Vegetables are published in this compact format to allow their wide use and understanding by governments, regulatory authorities, food industries and retailers, and consumers. This first edition includes texts adopted by the Codex Alimentarius Commission up to 2007. The Codex Alimentarius Commission is an intergovernmental body with over 170 members, within the framework of the Joint FAO/WHO Food Standards Programme established by the Food and Agriculture Organization (FAO) of the United Nations and the World Health Organization (WHO). The main result of the Commission's work is the Codex Alimentarius, a collection of internationally adopted food standards, guidelines, codes of practice and other recommendations, with the objective of protecting the health of consumers and ensuring fair practices in the food trade.